I find a few things wrong with it. The first of which is: why do non-hockey fans always refer to any work stoppage in hockey as a strike? This is a huge pet peeve of mine. Whoever made this picture knows enough to find out what Todd Bertuzzi’s salary was for this past season, but is obviously otherwise completely clueless as to what’s actually happening. I’ll get to that shortly. The author of the picture found a photo of a player crying to mock the players and make them out as crybabies. Here’s the problem: this picture of Bertuzzi had absolutely nothing to do with salary. It had to do with a much more serious issue and if you haven’t heard of it, go back to the cave you’ve been living in the past 8 years. The main issue I have is this: It’s not a strike, it’s a lockout. If the rinks were open and the players were refusing to play, then it would be a strike. That’s not the case now, nor was it the case in the past 2 lockouts of ‘94 and ‘04. The players want to play but can’t because the owners have locked them out of the rinks. They’ve basically been evicted until a there’s new collective bargaining agreement. It’s not just up to the players, it’s up to the league and the owners to come to terms with the players and open the doors. For many years, the players were not only not getting what they felt was their fair share, they were getting ripped off (hear that? That’s the sound of Alan Eagleson tiptoeing out of the room). Now that they’re getting a bigger piece of the pie, they’re looking to maintain it but the owners are looking for a bigger piece too. There’s only so much pie to go around, neither side can agree on who gets the biggest piece, hence the stalemate. Or, dare I say: lockout. People who are either misinformed, or completely uninformed, about hockey should try and understand that before they just criticize the players and call them greedy. Consider this: the players don’t get paid in the playoffs, the most important time of the hockey season, yet they play in every playoff game that they possibly can. You’d seriously have hit someone with a car before they’d even consider taking a game off in the playoffs. They do it for the love of the game and for a chance to raise the Holy Grail of hockey: the Stanley Cup. The final issue I have with the above picture is that it’s not just hockey; every major sport has labor issues and sometimes work stoppages. Baseball strike? Oh, that’s fine, totally understandable. For some reason, hockey’s the bad guy. Regardless of all the flaws, I can say that the maker of the above picture does have one point: hockey players are overpaid. But then again, it’s not just hockey players, you can say that about any athlete in any major sport. Not only that, you can say that about big Hollywood stars who get $10 million for making one movie. In the grand scheme of things, is being an athlete or entertainer that big of a deal? Certainly not. Is being a soldier, a doctor, or firefighter a more worthy profession? Absolutely. Are they underpaid in comparison to athletes and movie stars? No question. But that’s not the way this world works. Sad but true. Can you blame the players for taking high salaries, or do the owners deserve the blame for willingly shelling out millions of dollars for individual salaries? 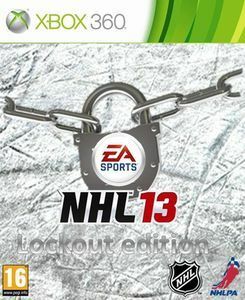 Personally, as a fan of this game (not so much the league), I blame both sides for this latest lockout. Everyone involved in the NHL plays a part in this and has the power to either end a work stoppage or prevent it from happening in the first place. Was it really a great idea to start negotiations for something so big a month before the season was scheduled to start? Uh, I’m going to go out on a limb and say probably not. My main point is that both parties are arguing over billions of dollars, it’s not just one side. They’re both equally to blame and you don’t need uninformed comparisons to see that. Have I mentioned that it’s a LOCKOUT? This entry was posted in Uncategorized and tagged blogging, hockey, lockout, nhl. Bookmark the permalink.